Welcome! 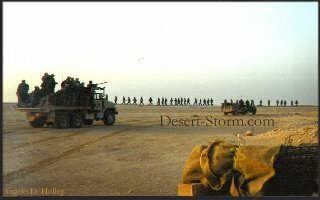 Desert-Storm.com is a site created to honor those who participated in Operation Desert-Storm. It is also intended to provide an informative resource about the war and the events surrounding it. Please take time to explore the entire site. Have a Great Day and Visit!! Please Sign Our Guestbook Please do not use this as a Message Board. Use the Forums! A portion of any sale supports this site.